Injured professional Bilawal Bhatti was unable to see Todmorden through to victory in a dramatic Lancashire League match yesterday. The Pakistani, who had split the webbing on a hand in the field, came in at number 11 with six needed to overhaul Haslingden’s 205 for seven total. However, he was trapped leg before by Jo Sipocz to give the visitors a five-run win, which took them above Andrew Sutcliffe’s side and into eighth place. Bhatti had earlier taken four for 81, his victims including visiting pro Burton de Wett for 52 from 56 balls. Tod lost Ben Sutcliffe without a run on the board and Ben Pearson soon followed but Simon Newbitt and Elliott Gilford added 86 to put Todmorden back in the match. De Wett eventually dismissed both, left-hander Newbitt for 77 from 97 balls and Gilford for 24. Martin Harlow took Tod to the brink of victory with 28 not out but the opening bowler ran out of partners with 10 balls left. Haslingden won by 5 runs. 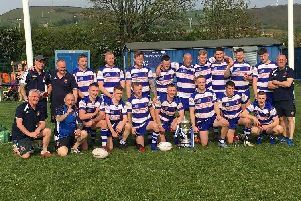 Todmorden 5 pts, Haslingden 12 pts. Bowling: Bhatti 17 1 81 4, Harlow 14 2 34 1, Gilford 8 0 28 1, A Sutcliffe 7 0 36 0, Priestley 4 0 23 0. Bowling: Sipocz 7.2 0 34 2, Neary 9 2 31 2, Griffin 17 2 59 3, Knowles 3 0 21 0, de Wett 12 0 51 3.